If you have a cat or a dog, it is important to provide them with the care that they need to live a long and healthy life. Westport pet owners can take advantage of all the services provided at our veterinary clinic in Dartmouth, including annual check-ups, vaccinations, preventive treatments, and dental care. In addition to regular cleanings and evaluations, we also offer advanced dentistry services, as needed. While many people think about canine dental care and feline dental care as purely cosmetic options to prevent bad breath and yellow teeth, there are lots of other reasons why you should make dental care a priority for your cat or dog. Most people think of dental disease as cavities, loose teeth, broken teeth or bad breath due to gingivitis. However, the truth of dental diseases is that they can actually be fatal. Any type of disease can lead to issues with other parts of the body, especially if decay and infection are present. In some cases, dental disease can even cause problems with major organs, including the heart, liver, and kidneys. The more preventive dental care you can provide at our veterinary clinic in Dartmouth, the healthier and happier your pet will be throughout their life. We don’t often think about how many teeth our pets should have, but if baby teeth do not fall out before adult teeth grow in, other dental issues can occur. When it comes to canine dental care, your dog should have 42 teeth when they are full grown, and for feline dental care, your cat should have 30 teeth when fully grown. 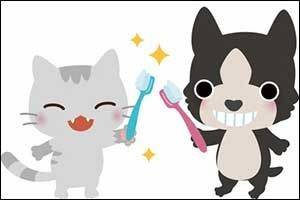 When you brush your pet’s teeth at home, you can count their teeth and ensure that they have a healthy mouth. If baby teeth do not fall out, tartar can build up around the tooth and gum irritation can occur, causing your pet chewing and eating problems in the future. Westport pet owners can ultimately save money by investing in canine and feline dental care early on in their pet’s lives. Think of dental care as a preventive treatment, which can help keep them healthy in many different ways. Regular cleanings and check-ups, which can be scheduled at your trusted veterinary clinic in Dartmouth, will help to improve your pet’s health and reduce costs associated with illnesses, disease, and other conditions throughout their lifetime. In addition to not losing baby teeth properly, which can lead to plaque build-up, if your pet doesn’t get the proper dental care they could lose their adult teeth prematurely, causing all sorts of problems with getting good nutrition throughout their senior years. Four out of five dogs over the age of three will have some degree of periodontal disease, which can lead to tooth loss and other issues. Canine dental care is extremely important to the ongoing health and welfare of man’s best friend. Feline dental care is important as well, reducing plaque build-up, bad breath, and issues with tooth loss in the adult years. Dogs and cats will instinctively hide any pain they are feeling. It’s something that goes back to when their ancestors lived in the wild. Unfortunately, this means that many pet owners will never know that their pet is in pain and suffering due to dental issues if they don’t get it checked out at the local veterinary clinic in Dartmouth. Westport pet owners should schedule dental check-ups alongside regular veterinary check-ups each year to ensure that their pets are pain-free and healthy. If you are interested in learning more about canine and feline dental care, give us a call at 508-996-3731. Our team can help you schedule an appointment for a dental check-up or talk about advanced dentistry options for pets in need. Westport pet owners and pet owners from all over the South Coast region have trusted the veterinary staff at Anchor Animal Hospital since 1965. Call today to get started on a healthy path for dental treatment and prevention for your cat or dog. Our mission is to provide high quality medicine, surgery, and preventative veterinary care to the South Coast of Massachusetts and the eastern shore of Rhode Island. We strive to bring the latest technology and techniques in a friendly, personal atmosphere. Looking for Quality Veterinary Care in the Fall River Area?